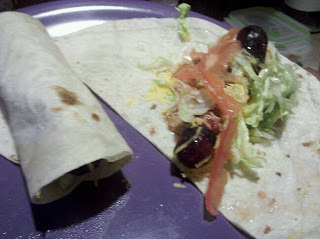 Hungry Jerks - Food Recipes and Restaurant Reviews: Mexican Hot Dogs, or, CHIHUAHUAS! Mexican Hot Dogs, or, CHIHUAHUAS! Sorry for the hiatus. But we are back to continue bringing you the treats for your taste buds. And going to start this return off with a little thing I like to call Chihuahuas. Or a Mexican Hot Dog. It is pretty simple. You take your hot dog and grill it until it has that nice burnt crisp around the outside of it. If you don't like grilled hot dogs then you're a freak because boiled ones are gross. Fact. After that you take your warm tortilla, and put your crispy dog in the middle. Then you add your favorite mexican food ingredients. I go with just some refried beans, lettuce, tomato, and taco sauce. Then wrap that bad boy up, and chow down. Boom. You just ate a Chihuahua!